Climbed on May 31, 2008. See the description for Store Kågtind. From the intersection where the bridge to Skjervøy forks right, continue 4 kilometer to Storstein where there is a ferry connection to Arnøya. On Arnøya, continue north about 3 more kilometer and look for a large building on your left that may be open for tourists in the season. Immediately before this house, there is a rough road that goes left. This is a good starting point. We made camp near the top of the first hill. Park without blocking traffic. 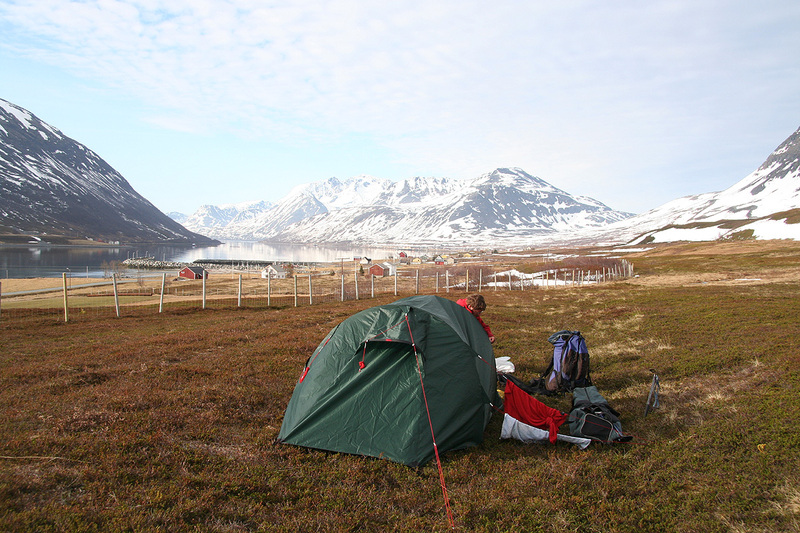 Our camp, which is quite near this road had location N70:07.565, E020:45.012, elevation 23 meter. 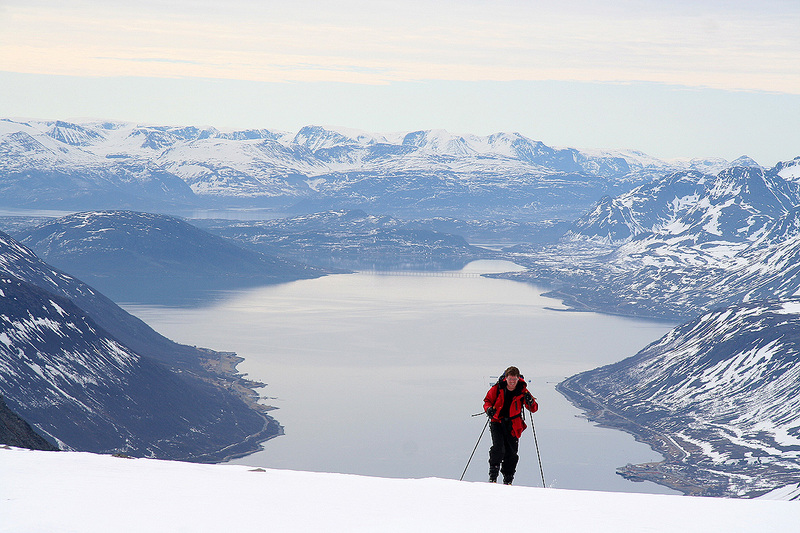 Route description: From this trailhead, the first kilometer is pretty flat as you head west and south of Tjuvtinden (686m). Enter Tjuvdalen and ascend on its right hand side. Higher up your route should turn more towards north. You see a distinct rock step up front. Either go to the left of this, or ascend the ramp and follow this wide and gentle slope from left to right. In the latter case, you will have to ascend a short, slightly steeper slope as your get across to the right side. Either way is fine. 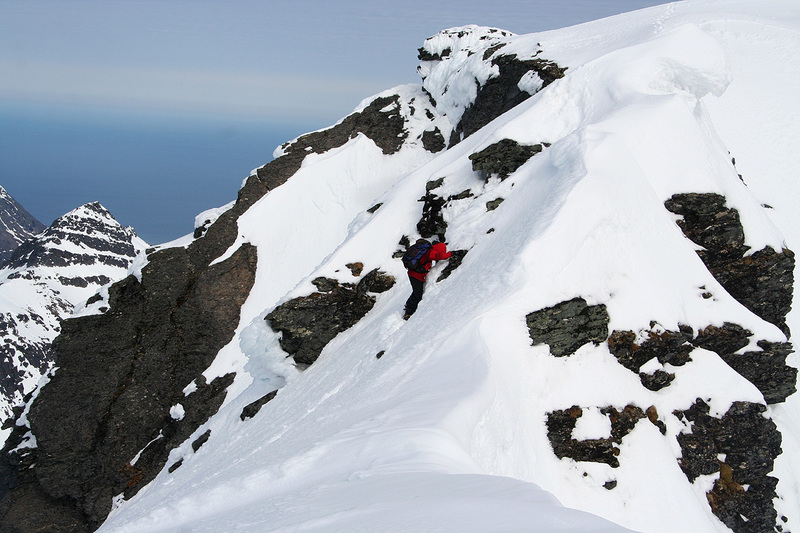 Above this step, the terrain is again more gentle, and easy skiing takes you to the saddle between Arnøyhøgda and point 833. This saddle has location N70:08.667, E020:40.911, elevation 706 meter. From this saddle, ski or hike (there was no snow when we were there), up the broad ridge to about 920 meter of elevation. Continue to climb the main ridge which is above you to the left. There is a short section of slightly steeper terrain, but nothing difficult. 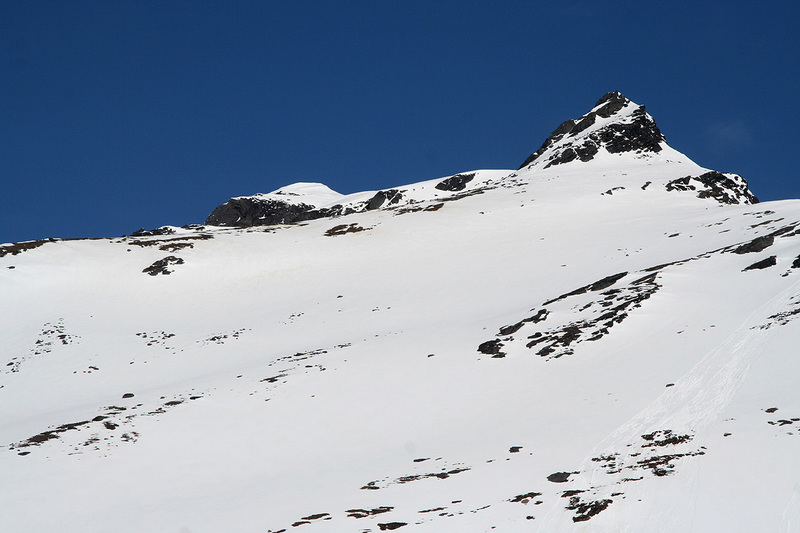 The ridge is pretty wide at this point, be careful with respect to possible cornices on the east side. Continue up this ridge. Higher up, you will arrive at a section that is more narrow. We proceeded slightly on the west side to a small "crack" that could be climbed and then provided access to the top ridge again. There is still a pretty narrow section before the ridge gets broader. Check the snow and walk across on the left side, paying respect to dangerous cornices that are overhanging to the east side (your right side). As soon as this section has been completed you are only a few steps away from the summit. Comments: I did this climb with my friend Geir Åke Dahlen. We arrived fairly early in the evening, had dinner and slept early. The next morning, we were ready to depart at 0630. The first section was dry and we carried the skis. Skiing up to the saddle at 706 meter was nice, but from there we had no snow and thus decided to leave the skis behind. Above 900 meter, there was again snow, but the going was not too difficult. 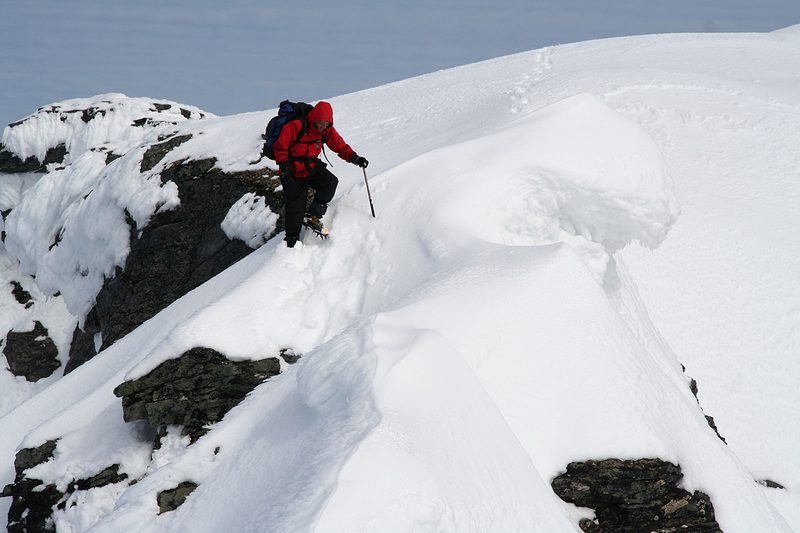 Higher up, we paid attention to possible cornice trouble, but the first part of the ridge was wide and caused no problems. I moved on, only to discover that the first top was a false summit and that the section beyond it looked difficult. The snow was pretty rotten and could easily slide if the slope was steep. 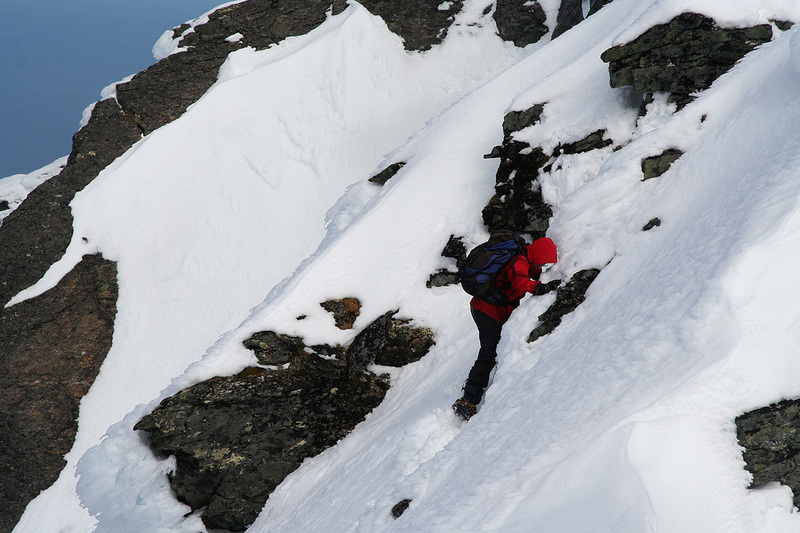 I carefully made a path along the west slope in order to gain a small "crack" that subsequently could be climbed in order to regain the top ridge beyond the difficulties. Åke was watching with mixed feelings. 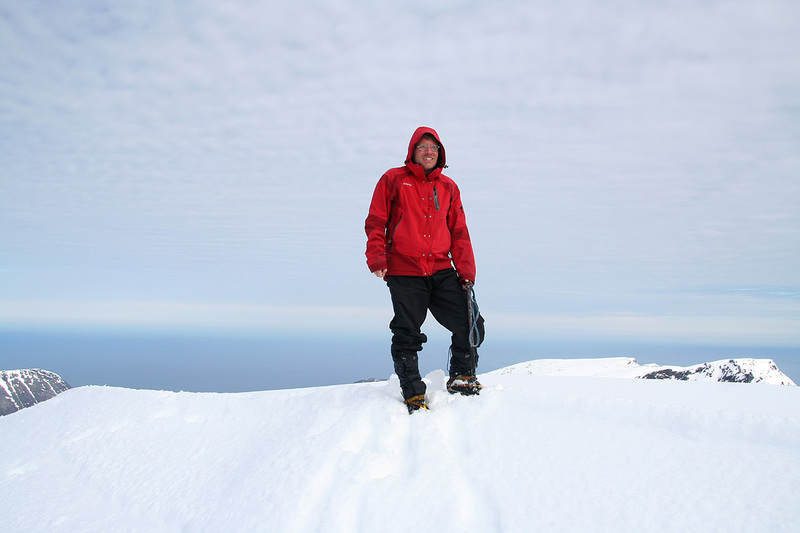 As I crawled on top of the main ridge, a new unpleasant discovery awaited. The next ten meter were quite narrow and clearly corniced on the right. On the left the slope quickly changed from moderate to steep to very steep.. I considered the ridge and the snow, then decided that it was safe to just walk across, staying about 2 meter left of the top edge. As soon as I was across, I shouted down to Åke that he should follow. For quite some time, he was out of sight and I wondered if he would decide to turn back. 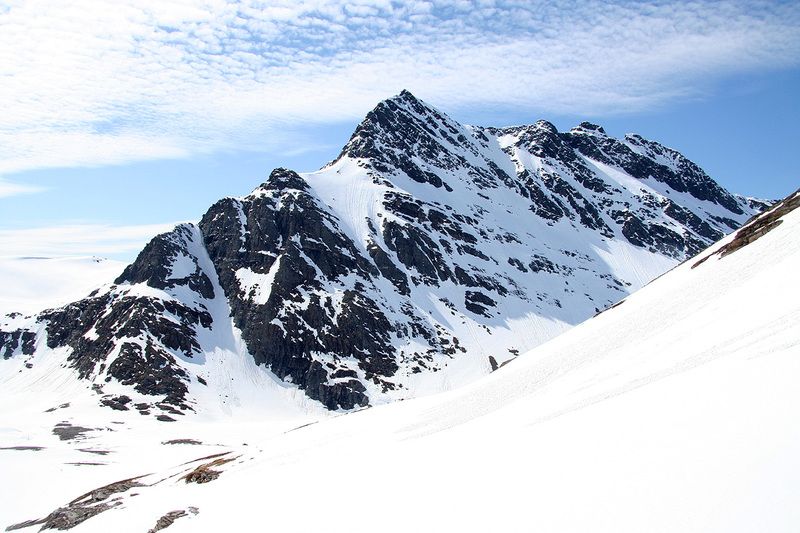 Finally, his head appeared above the ridge, and soon thereafter he arrived at the summit with a very appropriate statement: "this is the most demanding "Høgda" I have ever climbed." 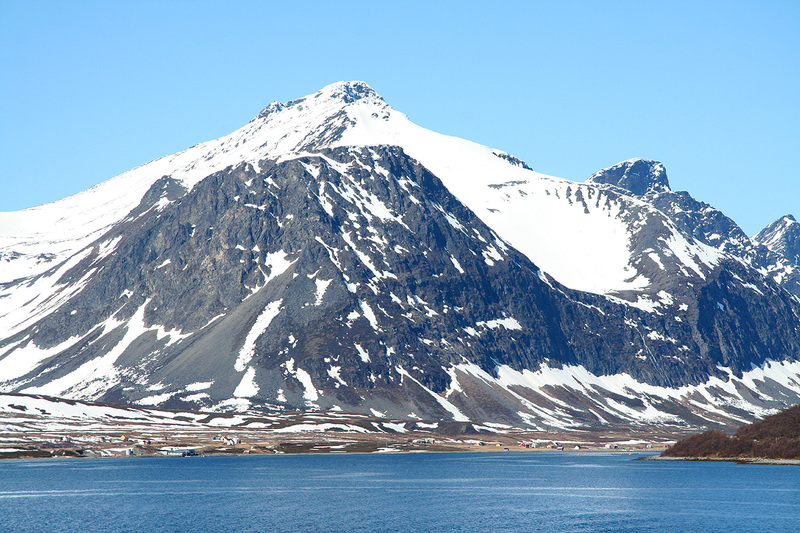 (In the eastern part of Norway, "høgda" normally refers to a rather gentle hill, typically with trees all over.) The time was 1030, the climb had taken us 4 hours. The sun was making the snow worse by the minute and I insisted that we should return back to the safer part of the route as soon as possible. 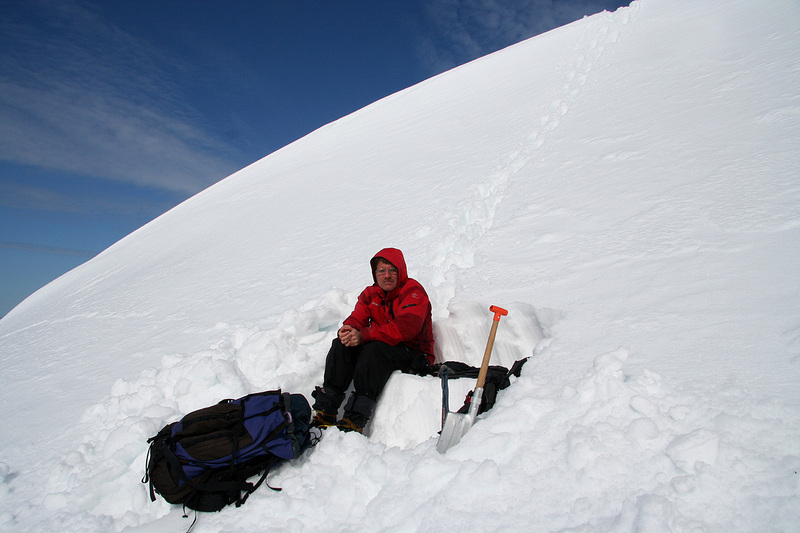 Soon, we were below the difficulties and used the snow shovel to dig a nice bench for a major rest. 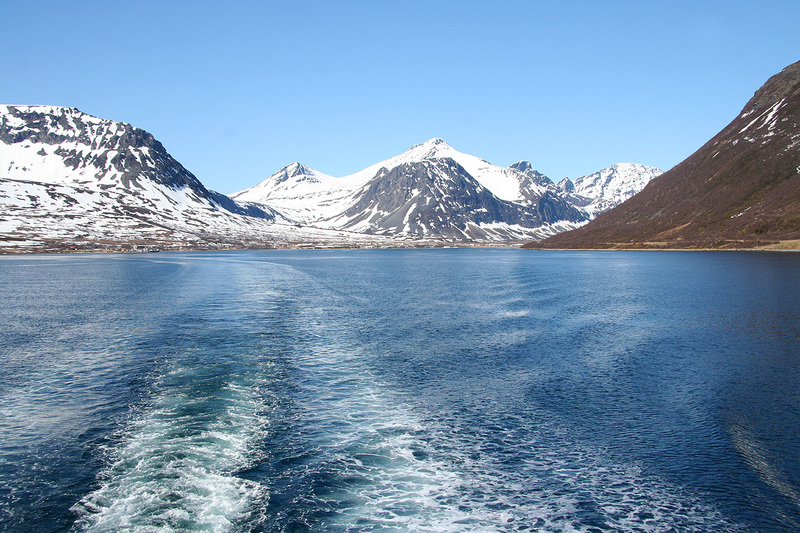 The scenery is arctic, clear and nice. Later, we continued down and noticed that the snow was indeed much worse. Happy to be back at the skis, we quickly made it down and returned to the tent at 1300. We drove to Skjervøy. 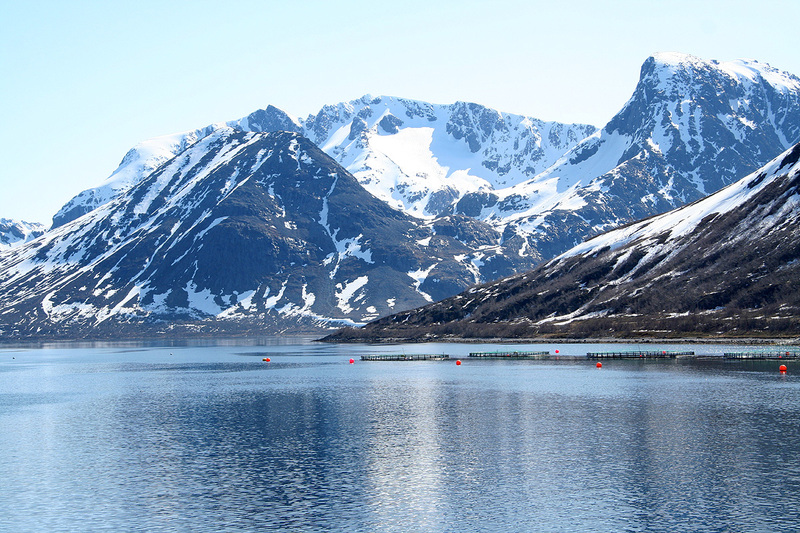 After dinner, Åke would take the coastal steamer (actually a luxury coastal cruise boat) to Tromsø in order to catch his flight the next morning. 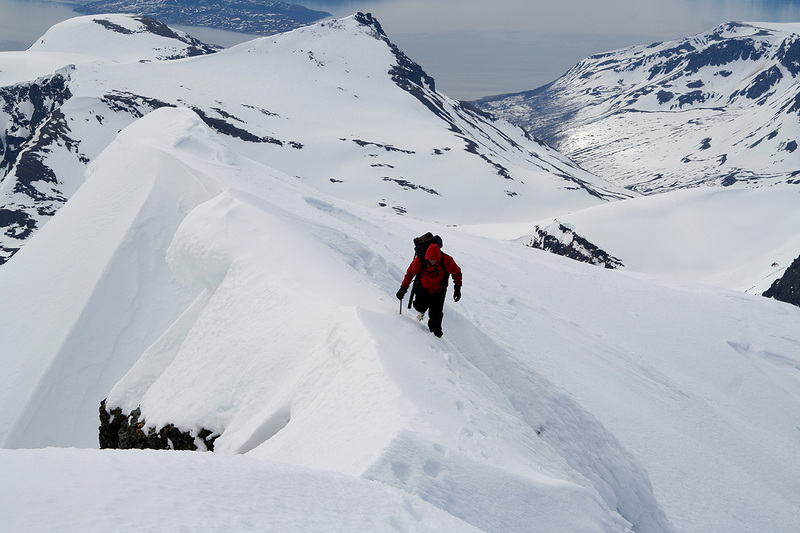 I stayed at hotel Maritim in Skjervøy for the night and prepared to climb Store Kågtind the next morning. Arnøyhøgda, as seen from the ferry. Arnøyhøgda, the summit is to the left. Ascending to the saddle. The bridge between the islands Kågen and Skjervøy in the background. 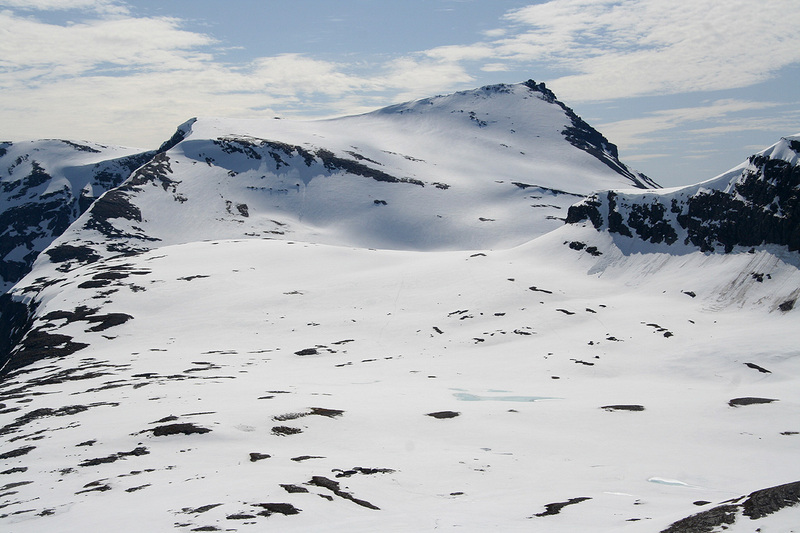 Sukkertoppen, 1044m, as seen when descending. Tågtinden, 874m, as seen when descending. 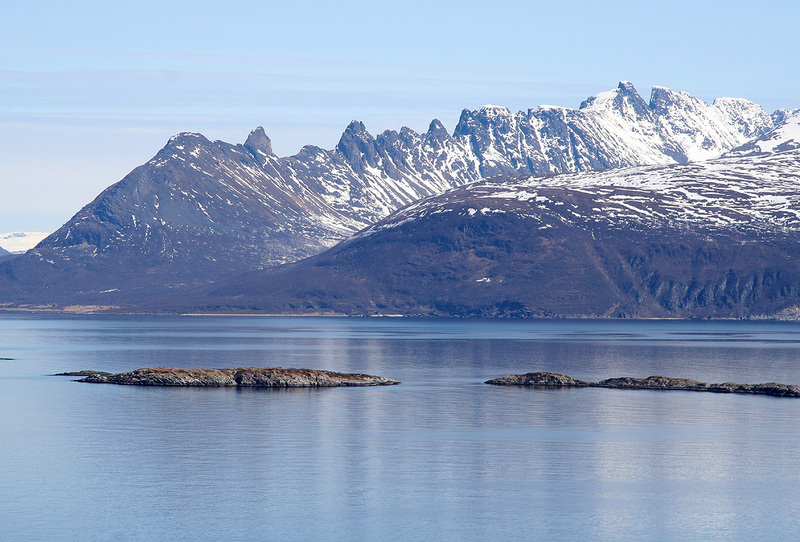 Kvænangstindane, as seen from the west. Store Kågtinden, as seen from the Arnøya ferry.